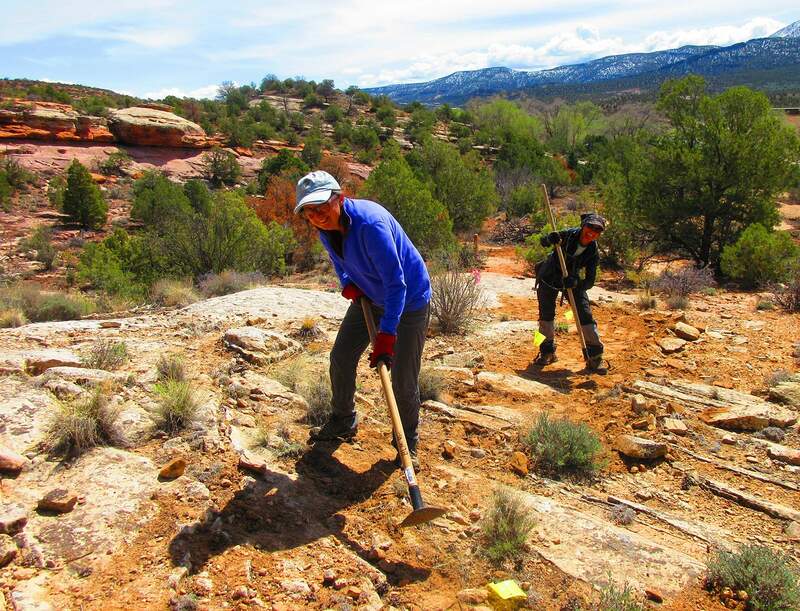 Volunteers Mary Kemp and Sherry Areen get a workout building a new trail at Sand Canyon on Friday. 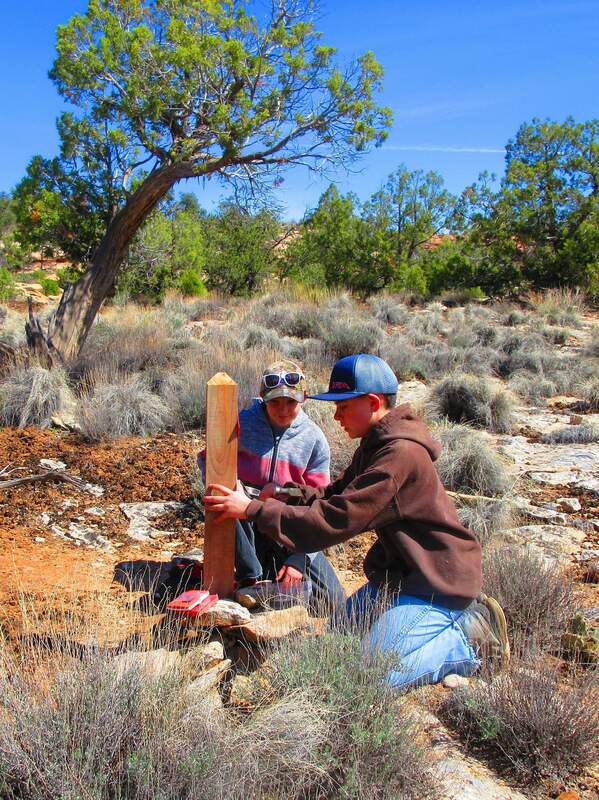 On Friday, 25 volunteers gathered with professional trail builders and government staff to construct a 0.4-mile trail from the new parking lot to the main stem of the Sand Canyon Trail, a main access for Canyons of the Ancients National Monument. 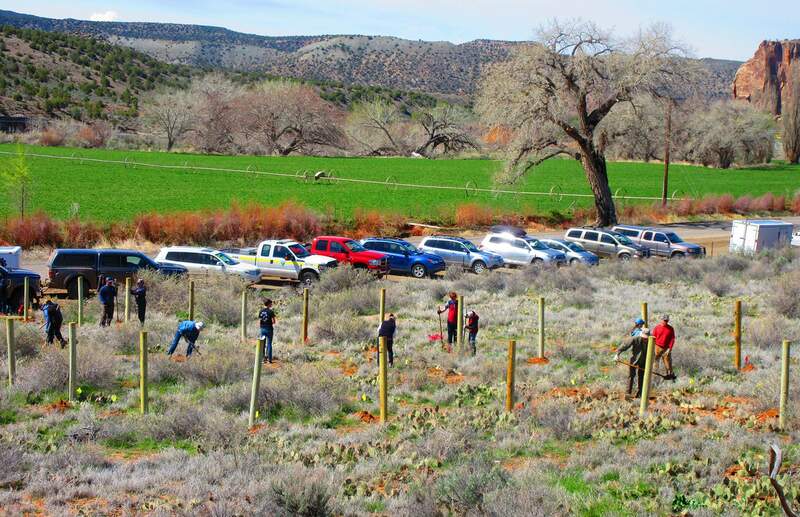 The new lot was installed by the county on its right-of-way easement, said James Dietrich, county public lands coordinator. It provides room for 40 passenger vehicles and horse trailers. This fall, the main BLM parking lot for the Sand Canyon trail will also be improved, Fouss said. It will be leveled out and expanded to handle 40 vehicles, up from 20 currently. More room will be made available for horse trailers. The uneven slickrock of the main parking area has been notorious for causing confusion and scraping the underside of countless passenger cars. As the trail’s popularity has grown significantly the past 10 years, overflow parking has lined narrow Road G during crowded weekends. “The use has been increasing, so it is nice to see everyone working together to find a solution,” said Mary Kemp, who was helping build the connector trail. 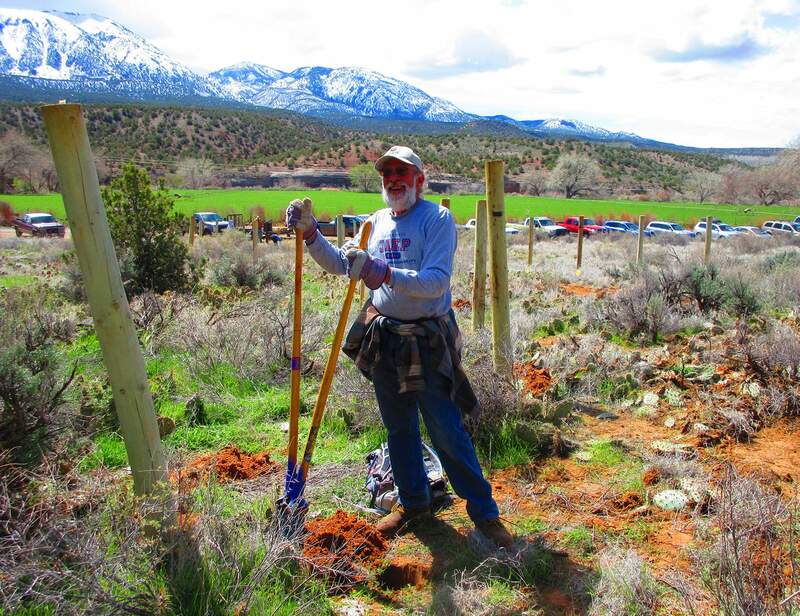 “Everyone deserves to come out here, and this is a sensible way to provide for that,” said trail builder Michael Kanzona, of Cortez, as he chopped in the new trail between survey flags. The new connector trail starts off on dirt, then quickly climbs onto slickrock that is marked by rock cairns and wooden trail markers all the way to the main stem. It was completed in one day. 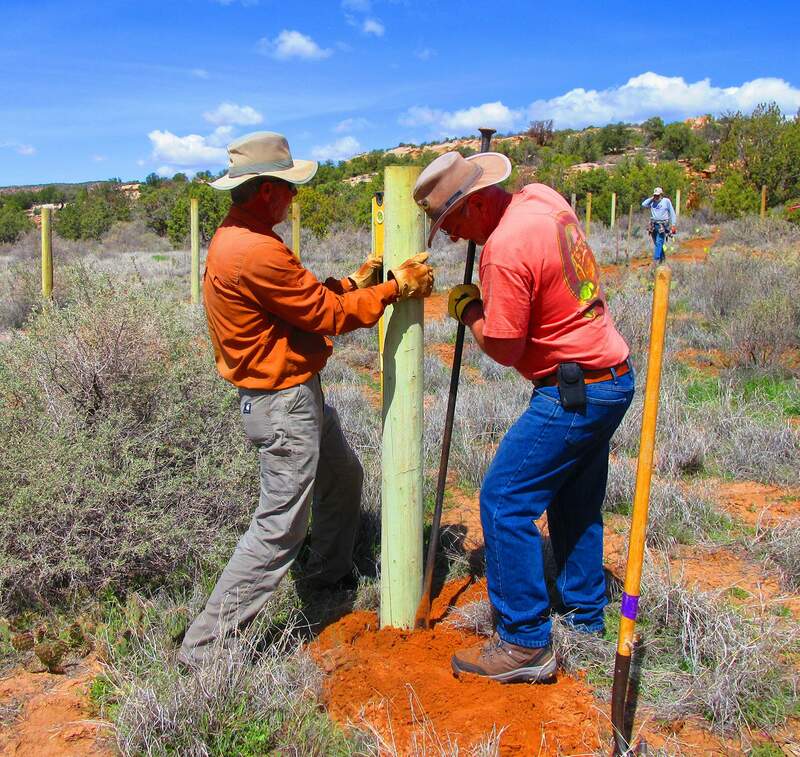 Wooden pole fencing at the beginning directs users down the trail and away from sensitive natural resources and nearby private property. New signage was also installed. 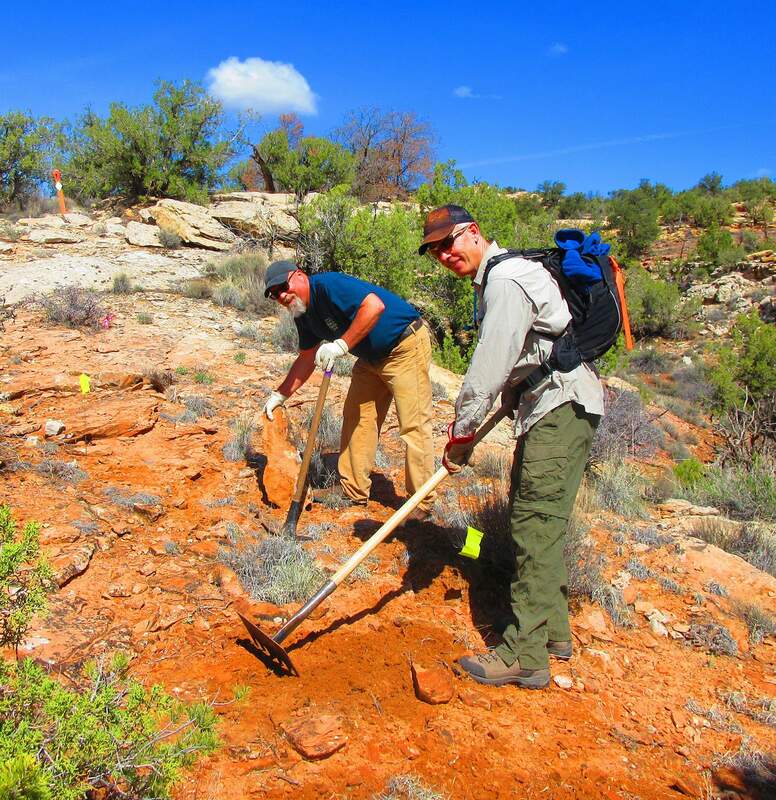 The Sand Canyon Trail and its new connecting spur from the new parking lot are open to hiking, mountain biking and horseback riding. The back story on the new county parking lot deserves credit, Dietrich said. County Road G was once a state highway with a 120-foot easement. When it was released by the state many decades ago and handed over to the county, the easement remained, allowing ample room for today’s improved trailhead parking.